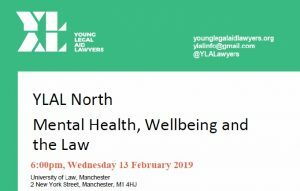 On 13 February 2019, Young Legal Aid Lawyers and 18 St John Street present a free seminar on Mental Health, Wellbeing and the Law. On behalf of Young Legal Aid Lawyers, and linked to the Bar Council’s commitment to promote wellbeing within the legal profession, current 18 St John Street pupil barrister Verity Quaite has organised a seminar to be held on 13 February 2019 at the University of Law, Manchester. The expert speakers at the event are Yvonne Healing, a barrister at 18 St John Street Chambers, and Kate Thorpe, a Therapist and Stress Management Coach. Refreshments will be provided following the talk and there will be an opportunity to network with the speakers and fellow attendees. Yvonne Healing is Head of the Family Department at 18 St John Street. She has vast experience in the conduct of care proceedings for all parties and conducts hearings in courts at all levels. The majority taking place in the Family Courts and the Family Division of the High Court. Yvonne is also a qualified mediator and an experienced practitioner and teacher of meditation and yoga. She will be giving a brief insight into her practice and how yoga and meditation have helped her and then there will be an interactive session where she will give practical tips on meditation. Kate Thorpe is a Therapist and Stress Management Coach, and an ex-solicitor. Kate has delivered workshops and presentations on Stress Management Strategy to clients across the globe. She helps individuals and organisations to improve wellbeing, productivity and resilience through bespoke therapy, workshops and coaching. Kate will be talking about what happens to the body when we are under stress and what we can do to manage that. She will also have a practical session and give tips on stress management.